In case you were hoping the new seventh-generation 2019 Jetta would be doing direct battle with the $16,790 base Honda Civic, the identically priced Toyota Corolla, the $15,999 Hyundai Elantra, or any other sub-$17k compact sedan, think again. In fact, it won’t even undercut the $19,995 Subaru Impreza that comes standard with all-wheel drive. Instead, Volkswagen’s second-most affordable car will enter the Canadian market at $20,995, which represents a significant $4,600 bump up from the outgoing 2017 Jetta. Of course, for that money you can expect more standard features than the older car as well as its peers. For starters the new 2019 Jetta won’t be available in base Trendline trim, so say goodbye to 15-inch steel wheels with plastic covers. Instead, all 2019 Jettas will receive alloy wheels starting at 16 inches, as well as auto on/off LED headlights with a coming and leaving home function, plus LED daytime running lights, LED taillights, an electromechanical parking brake, a multifunction trip computer, cruise control, a proximity-sensing infotainment display measuring 6.5 inches in base trim, Apple CarPlay, Android Auto and MirrorLink smartphone connectivity, Bluetooth wireless phone connectivity with audio streaming, an SD card slot, a USB input, four-speaker audio, a static backup camera, a front centre armrest with a storage tray, heated front seats, 60/40 split-folding rear seatbacks, tire pressure monitoring, all the usual active and passive safety features, and more. 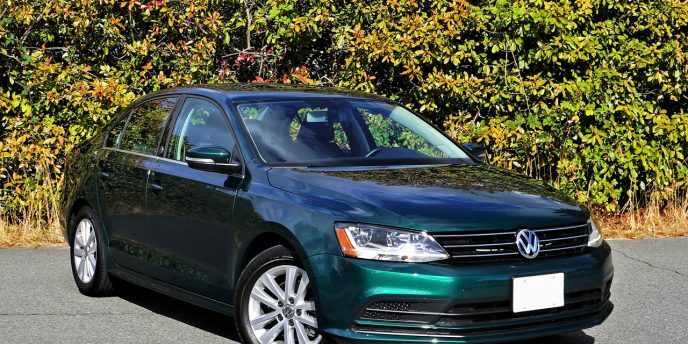 As impressive as some of its base features are, some of the 2019 Jetta’s less expensive competitors are now coming standard with auto on/off LED headlights too, plus similarly large infotainment displays with backup cameras, etcetera, while even more impressive, some competitors are now being shipped with standard advanced driver assistance systems that cost extra with the Jetta. For instance, all Corolla trims include autonomous emergency braking with pedestrian detection, lane departure warning with automatic steering assist, adaptive cruise control and LED headlights with automatic high beams. While these features will be optional on the mid-range Jetta Highline, as will blindspot monitoring with rear cross-traffic alert that’s also available with most rivals, VW will step up its safety offering with a new class-exclusive automatic post-collision braking system designed to automatically apply the brakes after an impact, which would stop the vehicle even if the driver were incapacitated. While much is new some things stay the same, starting with the Jetta’s sole 1.4-litre turbocharged and direct-injection four-cylinder engine. It puts out three fewer horsepower resulting in 147 instead of 150, plus an identical 184 lb-ft of torque, while it once again drives the front wheels via a standard six-speed manual gearbox, which no doubt to the delight of performance fans everywhere continues to be offered in all trim levels. The available Tiptronic automatic transmission remains a very reasonable $1,400 option yet sports two more forward speeds for a total of eight, while it also boasts a new auto start/stop system that temporarily shuts the engine off when it would otherwise be idling to save fuel and reduce emissions. The new Jetta will also come standard with an Eco mode to reduce fuel consumption even further, but unlike the outgoing Jetta no engine upgrade option is yet available. Better news has the 2019 Jetta riding on Volkswagen’s more advanced Modular Transverse Matrix (MQB) platform architecture, which currently underpins the award-winning Golf. This said the latest Jetta won’t be on the receiving end of the MQB platform’s most-lauded component, its fully independent rear suspension that unfortunately makes way for a cheaper torsion-beam setup. This may change for a future Jetta GLI, however, so VeeDub’s legions of performance fans will want to keep their collective fingers crossed, but then again Volkswagen has already lost many of these one-time loyalists to Civic Nation which has long offered an independent rear suspension in its least expensive base trim, let alone the mighty Civic Si and Type R variants. Hyundai offers an independent rear suspension in the Elantra Sport as well, as do some others in this class. 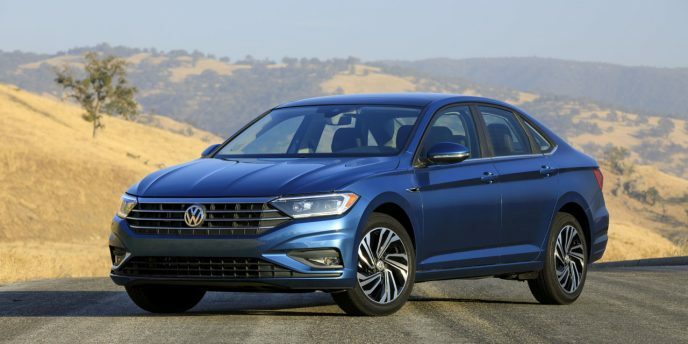 Just the same, the majority of Canada’s compact sedan buyers will find the new Jetta’s 32-millimetre (1.3-inch) longer wheelbase, now spanning 2,685 mm (105.7 inches), greater width, taller roofline and resultant increased interior room more appealing, while its shorter front and rear overhangs, combined with a more gradually sloping four-door coupe-like rear pillar, provide a sportier visual profile. Still, while the new Jetta’s design is slightly sleeker and somewhat more shapely than the car it replaces, featuring a larger, bolder grille that integrates nicely into LED headlamps, its stately lines lean more toward the current model’s conservatism than the initial design sketches’ (see the gallery) low-slung drama, which puts it on a safe route that should help it appeal to the auto market’s large base of low-key consumers, while enjoying a longer shelf life than something more radical otherwise would, which may earn it a stronger resale value too. Along with more space inside, Volkswagen promises a more upscale, premium-like passenger compartment, at least up front. More soft-touch synthetic surfaces will provide improved refinement, while the overall interior design has been modernized with the infotainment display more prominently mounted higher up on the instrument panel’s centre stack for easier access with less distraction away from the road ahead. What’s more, the top-tier Execline model includes a fully configurable colour TFT gauge cluster dubbed Volkswagen Digital Cockpit, similar to the Audi Virtual Cockpit. Upper trims in mind, the mid-range Highline model starts at $24,095 and features standard proximity access, pushbutton ignition, a larger 8.0-inch infotainment touchscreen, voice recognition, two additional audio speakers for a total of six, satellite radio, a larger powered panoramic sunroof, and blindspot monitoring with rear cross-traffic alert. As noted earlier, Highline trim allows the addition of an optional $995 Driver Assistance Package with auto high beams, adaptive cruise control, autonomous emergency braking, and lane keeping assist. Also available with Highline trim, the $1,700 R-Line Package adds 17-inch alloys, fog lamps with integrated cornering lights, special R-Line exterior design details including glossy black painted exterior mirrors, plus R-Line badging, remote start (with the automatic transmission only), 10-colour ambient cabin lighting, a black headliner, an R-Line steering wheel, a sport suspension, and Volkswagen’s Cross Differential System (XDS) that applies braking to the inside front wheel in mid-turn to enhance cornering capability. The top-tier Jetta Execline, which starts at $27,695, makes the XDS system, 17-inch alloys, and ambient interior lighting standard, while upgrading the headlights to lens-type full LEDs featuring unique LED signature daytime running lights, chromed window surrounds, side mirrors with integrated turn signals and memory, the Volkswagen Digital Cockpit, a leather-wrapped steering wheel rim and shift knob, rain-sensing wipers, an auto-dimming rearview mirror, illuminated vanity mirrors, dual-zone automatic climate control, a six-way powered driver’s seat with two-way powered lumbar and memory, front seat ventilation, perforated leather upholstery, a 400-watt eight-speaker BeatsAudio sound system, and more. The Jetta Execline is also available with the Driver Assistance Package. Today’s outgoing Jetta has been steadily losing sales since its highpoint of 31,042 units in 2014, its 2017 sales of 17,483 units showing a decline of 43.7 percent over four years and a year-over-year downturn of 16.5 percent since 2016 alone. This is partially due to greater consumer interest in compact SUVs like Volkswagen’s Tiguan, but it can’t be overlooked that the aforementioned Civic and Corolla have gained market share over the same duration, as has the Kia Forte and Volkswagen’s own Golf. Volkswagen is banking on this redesigned 2019 Jetta finding similar upward momentum to that stylish Golf, and likewise it’s hoping to pull from the Jetta’s 600,000-plus previous Canadian owners to achieve that. Still, with much higher than average base pricing, a deficit in standard advanced safety technology, and a low-rent rear suspension design it’s going to be an uphill battle. Having grown up in the sixties and seventies it's difficult not to like Volkswagen's retrospective editions, and while looking in the proverbial rearview mirror normally has us focusing on VW's Beetle line of compacts, in this case I'm talking about the four-door compact Jetta. Specifically the 2017 Wolfsburg Edition, in Bottle Green with a black, grey and orange interior. The Bottle Green paint, which is new for 2017, is probably the design element that's most respectful of the past, as this rather normal looking three-box four-door can only be considered retro due to being mostly unchanged for so long, but peek through its windows and you'll start to understand more of what I'm talking about. 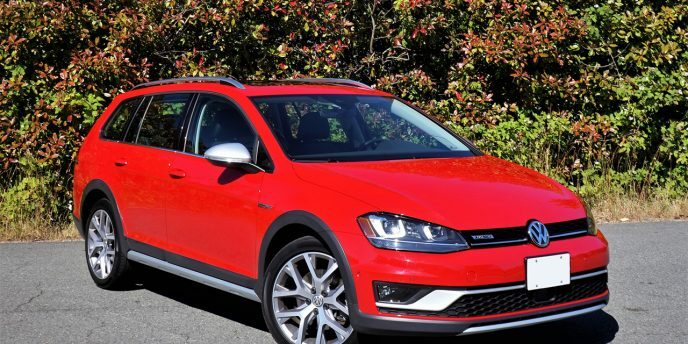 All the excitement in Volkswagen's Golf SportWagen family has recently been focused on the new AllTrack, a model I personally applied plenty of praise to earlier this year, but last year's redesign of the AllTrack's more traditional five-door sibling deserves some well earned attention too. 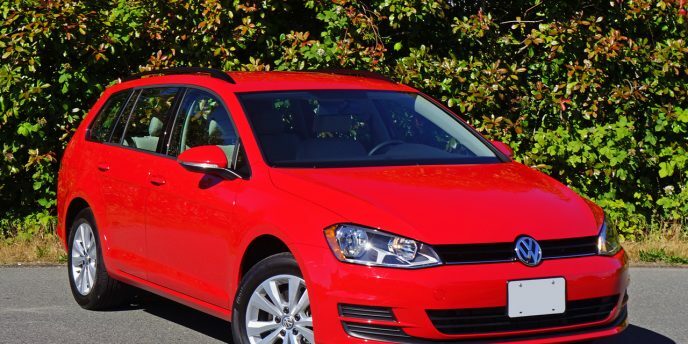 After a comprehensive ground-up makeover for 2016 the Golf SportWagen moved into 2017 mostly unchanged, except for some minor package updates, which is fine by me as it was near ideal already. It's lighter now thanks to VW's new MQB platform architecture that also underpins a wide range of models from subcompacts like the Polo, unfortunately not available here, to larger SUVs including the new mid-size Atlas, while its interior gets all of the premium upgrades enjoyed by other new Golf models. 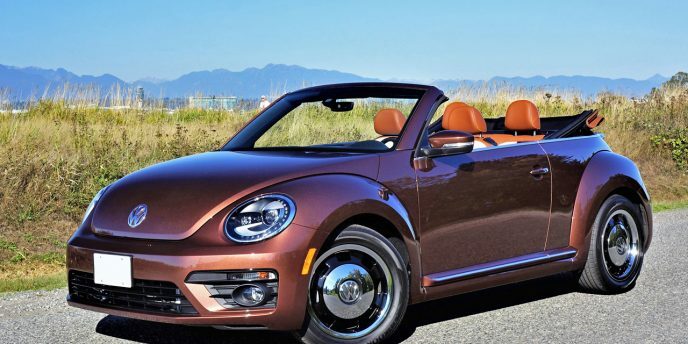 Those who grew up with VW Beetles in their lives can't expect everyone to appreciate their unabashed affection for the unusually shaped conveyance, but luckily there are still enough of us out there to continue its production. Word has it the Beetle's days are numbered, but fortunately it has some life in it yet. My most recent Beetle tester was a smart little Convertible in Classic trim, painted a lovely Dark Bronze Metallic that was more of a chocolate brown, with an ideally matched almond Beige soft-top. The colour reminded me of my dad's personally repainted '66 Beetle that started metallic brown yet ended up a strange yellow-orange we kids endearingly called puke, but that's a story for another time. Drumroll please… And the winner of the 2017 Auto Journalist Association of Canada's Canadian Car of the Year award is (ratatatat) the 2017 Volkswagen Golf AllTrack! Well that one caught me by surprise, as did the selection of the 2017 Subaru Forester for the Canadian Utility Vehicle of the Year. Not that these two compact crossovers aren't worthy, but the Subie was merely a mid-cycle refresh, and a mild one at that, and the COTY winner was (as just stated) more of a crossover SUV than a car, or at least that's how VW classifies it on their retail site.